t*rexes and tiaras: shot by bedroom eyes..
Day 8 of Selina's May FBlogger Challenge: Something you'd forgotten about which you love. About a month ago my futile attempts at spring cleaning caused me to take out a bag of clothes from under the bed, which had been stored there for a while. In it was this blouse, which I got for my birthday when I was in college, after lusting after it for a few months. I wore it with all kinds of outfits; under dungarees, with jeans (yes, I used to wear jeans; it's only recently that I've developed The Fear) and with skirts. I'd totally forgotten about it until it came out from the underbed storage. Now that it's been washed and ironed and still seems to fit me, I'll be making an effort to wear it more often. I've had a crazy busy day, but a productive start to the week - I was up with the sewing machine going at 6am this morning as I just had so much to get through, but I'm very much liking this burst of enthusiasm and productivity. Now off to try and shave a minute off my swimming time. It's a great print, very apt. 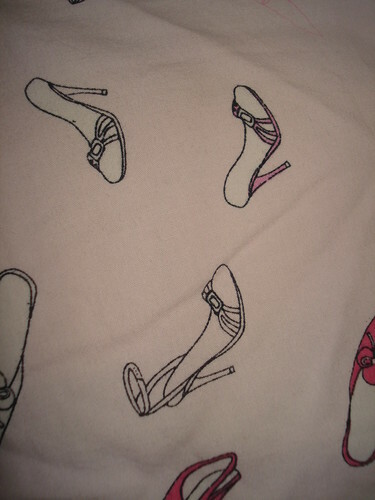 loving the blouse, a girl can never have too many shoes. This blouse has your name written all over it Char! I love finding things i'd forgotten about :D it's great, i bet it looked so cute with dugarees! Love the blouse! Can't believe you got up at 6am to sew... I admire your dedication!